Have you been making do with a hydraulic system that doesn’t quite fit your needs? 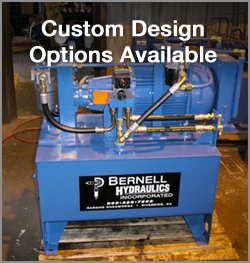 Why not invest in a custom system from Bernell Hydraulics that will meet your needs exactly? We have created plenty of different custom hydraulic systems in Alhambra CA and we are eager to help with your project too. Our engineers and designers can help you take your custom concept from a dream to a reality. You can rest assured you will receive expert assistance at every stage of the process, from design to parts selection and construction. Our engineers and machinists are ready and willing to put their talents to work for you. All custom hydraulic systems in Alhambra CA will be subjected to rigorous testing for quality control before being delivered to your work site, so you know you can depend on them. If you work with custom hydraulic systems in Alhambra CA, you know that custom systems have their own quirks. Because you may have custom-machined parts in your system, you won’t have the typical manufacturer’s guidelines to fall back on regarding operating conditions and maintenance schedules. Fortunately, when you buy your custom system from us, we can provide you with this information. We can not only advise when service will be needed, but also perform that service for you. We can change fluids, replace hoses, and manufacture new custom parts and fittings as needed. At Bernell Hydraulics, we’ve been dedicated to keeping all your hydraulic equipment and running since 1977. We can draw on our wealth of experience to provide high-quality service for custom and store-bought hydraulic systems alike.